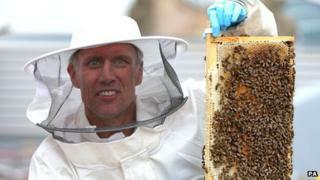 Former Happy Mondays dancer Bez has given his support to a campaign to save the honey bee within UK cities. The 49-year-old, real name Mark Berry, has helped install two bee hives on the Printworks in Manchester city centre. The self-confessed "full-time honey monster" has been keeping bees for about a year on a commune in South Wales. A rapid decline in honey bee numbers is thought to be due to last year's prolonged winter and wet summer. Bez said: "It has been a big part of our family life since my granddad came back home from the war with four tins of honey. "It's magical really because the bees have been around since the days of the dinosaurs. They are a great part of our diversity." Four beehives have also been installed on the roof of Manchester Cathedral to help boost numbers. The city of Manchester incorporates the insect in its coat of arms as a symbol of industry, community and teamwork. Last winter's losses of honey bee colonies were the worst since records began six years ago, according to the British Beekeepers Association. It said more than a third of hives did not survive the cold, wet conditions. Who, what, why: How do you track a honey bee?